What Kind of Paint to Use for Porches? If you're wondering whether you can put a coat of exterior varnish over interior paint, the quick answer is "yes." The most common type of varnish on the market is called polyurethane, and exterior polyurethane may or may not include the word “spar” in the product title. The word “spar” indicates that the polyurethane is well-suited to exterior exposure. There are three very different grades of wood finish: interior, exterior and floor. Interior paints and varnishes are formulated only for indoor exposure. They are not formulated to withstand UV light, heat, cold and precipitation exposure. Interior paint and varnish are used to finish and refinish solid wood furniture and cabinetry and cabinetry made out of other wood products like MDF (medium density fiberboard) and particleboard. Interior paint and varnish cover interior kitchen cabinets and bathroom vanities very well. Many people do not realize that when you refinish furniture and cabinetry with interior paints you must also add at least one coat of interior-grade varnish over the dried paint. Varnish seals the paint and prevents interior changes in humidity from adversely affecting the painted surfaces. For example, if you refinish a set of dining room chairs with black paint and do not seal the paint after it dries, clothing will stick to the chairs and become stained. One or two coats of interior varnish will seal the paint and not affect the color. Manufacturers include special additives in the paint and varnish (most of which are closely protected forms of intellectual property) to help exterior finishing products withstand exposure to UV, heat, cold and precipitation. Exterior paint and varnish are formulated to withstand years of direct exposure to the elements. Because different areas of the country are exposed to different weather patterns, different exterior paint and varnish formulas have to be created and made available in those areas. Floor varnish is inherently an interior-grade varnish that forms a very tough, durable hardwood finish coating. Floor varnish can be used to finish horizontal furniture surfaces that take a lot of abuse, like desk and table tops and chair seats. It is a more expensive product than regular interior varnish, so for the budget conscious, use floor varnish sparingly on furniture projects. Mixing one grade of paint with a different grade of varnish is not recommended. The finish will only be as tough as the weakest finish grade. 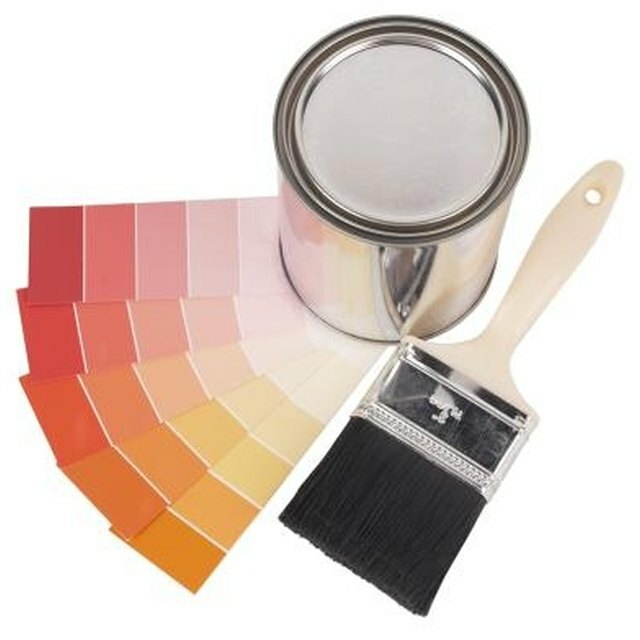 It is fine to use exterior-grade varnish over interior-grade paint when the finished item will remain indoors, but not if it is intended for use outdoors. The exposure to the elements will degrade the paint layer and cause the varnish to fail, even though the varnish is exterior grade. Likewise, you should not use an interior-grade varnish over an item finished with exterior-grade paint when the item is intended for use outside the home. It is best, when the finished item is meant for use outdoors, to combine an exterior-grade paint and an exterior-grade varnish. What Are the Dangers of Industrial Painting & Fumes? Can I Use Flat Exterior Paint on My Deck? What Is a Snow Coat on a Mobile Home Roof? Can I Apply a Gel Coat Over an Existing Furniture Finish?